Soldiers from all time periods – past, present, and future – such as the aviator, cavalryman, commando, heavy foot soldier, marine, and rifleman . 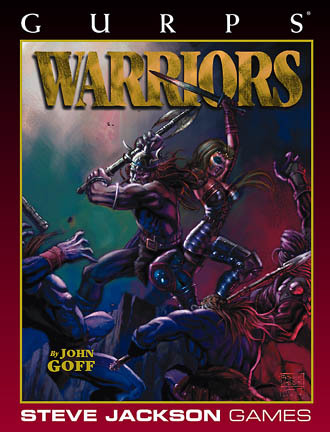 . .
Warriors from the pages of history and literature, including the barbarian, berserker, gunslinger, holy warrior, martial artist, and swordsman . . . Specialist warriors like the archer, engineer, guard, guerrilla, sharpshooter, and scout . . . Highly trained operators of weapons of war, such as artillerist, aviator, mecha pilot, and naval crewman. Warriors also provides many templates suitable for use by the GM as is to represent NPC soldiers, mercenaries, or guards. Each template comes with four original characters, drawn from a wide range of settings, giving you 116 ready-to-use sample characters as well as historical background and information on the technology and tactics that helped shape many of these professions, to help you better detail these characters.